LiveCode LessonsData GridLiveCode Data Grid Working With Data Grids (Forms & Tables)How Do I Export Data From A Data Grid? This lesson will show you how to get data out of a data grid. Here is what the data grid looks like that I will be exporting data from. This is the code that was used to populate the data grid. This shows you the keys that each record has (FirstName, LastName, Title and Image URL). 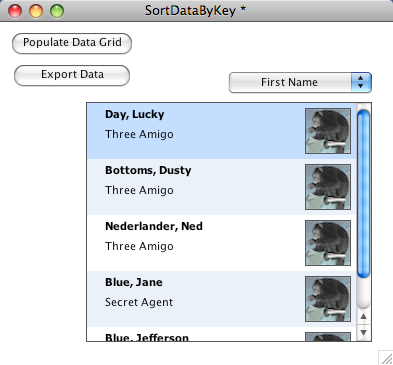 This is an example of how to get data out of a data grid. I begin by getting the dgData array and the dgIndexes. The indexes are a comma delimited list of the keys of the dgData in the proper order. After you have the array and the ordered list of indexes you can loop through each record in the array. 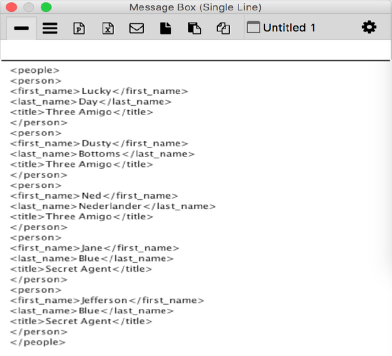 In this example I'm just wrapping the data in XML tags. This is what the output for my example looks like in the message box. Prev: How Do I Determine If the Data Grid Has Focus? Next: How Do I Work with Checkboxes in a Data Grid? I dont want to export the whole grid, I just want to access a specific cell and export its contents. For example the contents of the cell of row 2 column 2. How do I do that please? There are a couple of way you can do this. The first is to get the array associated with the whole table and look in the row and column you want e.g. Or just get the data associated with the line you are interested in and look up the column you want e.g. If you don't know the name of the column you want, just its position you can use the columns property of the Data Grid e.g. You might also find this lesson on getting the data associated with a row or column helpful.